This year your Thanksgiving guest list includes the old staples of aunts, uncles, and your cousin's weirdo boyfriend, but if you were so lucky to host famous modern artists, this is how they might arrange their plates, as imagined by artist Hannah Rothstein. 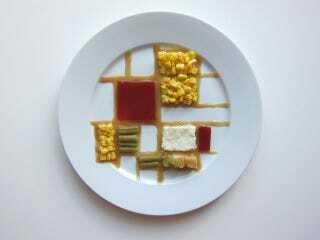 She features theoretical plate stylings of the likes of Piet Mondrian (above) Georges Seurat, Pablo Picasso, Vincent Van Gogh, Andy Warhol, and more. You can see the rest of the Thanksgiving plate collection on Rothstein's website. She's selling them there, and 10 percent of the proceeds will go to the SF-Marin Food Bank.